Integrates with major open source and commercial application servers to provide high-scalability and fail-over support for clustered Ajax Push-enabled ICEfaces applications. Provides distributed management of Push blocking connection to any number of deployed ICEfaces applications and portlets in both a stand-alone and clustered environments. Designed to Load-balance for failover of blocking push connections. Supports Servlet 3.0 Asynchronous Request Processing (ARP) integration for thread-level scalability. Enterprise Push Server is required for deploying multiple Ajax Push applications to the same domain. It delivers push server capabilities and key features targeted at enterprise deployments in either stand-alone or cluster deployment environments. Enterprise Push Server fully supports stand-alone deployments of any number of ICEfaces applications that are Ajax Push enabled. 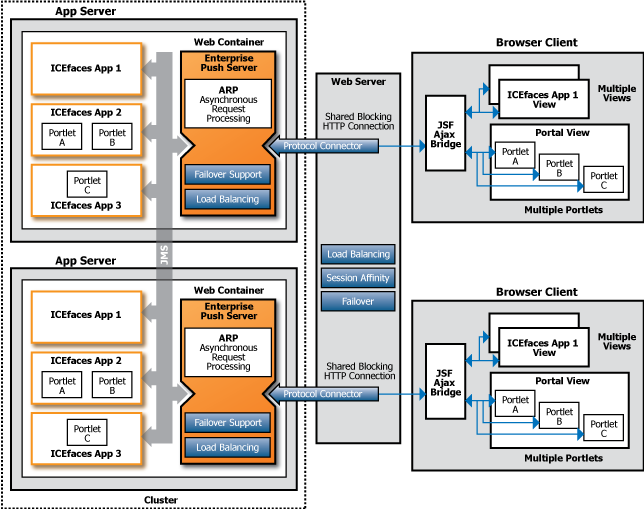 It manages a single blocking connection per browser instance to one or more ICEfaces applications, while the ICEfaces Ajax Bridge shares that same single blocking connection to EPS with one or more ICEfaces application views. A basic stand-alone deployment utilizes an optional web server and JMS for inter-process communication as illustrated below. The Enterprise Push Server fully supports clustered deployments of any number of ICEfaces applications that use Ajax Push. Multiple servers coordinate to perform shared management of a single blocking connection per browser instance to one or more ICEfaces applications deployed to multiple nodes within the cluster. A basic clustered deployment utilizes standard web server load balancing with sticky sessions, and JMS for inter-process communication, as illustrated below. The Enterprise Push Server enables high-availability deployments based on session replication and fail over. Each deployed server will automatically follow sessions that migrate between nodes in the cluster. Failover of the Enterprise Push Server itself is also supported, so if one server fails, the sessions being managed there will be automatically redistributed between the other running servers. Supporting thread-scalable deployments of the Enterprise Push Server is achieved through integration of the Ajax Push mechanism with an ARP implementation. Enterprise Push Server supports the following ARP mechanisms.